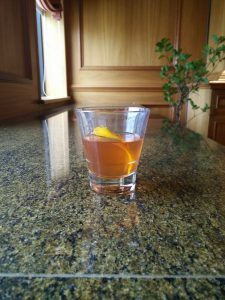 This week’s cocktail is a variation on the Sazerac – a great drink to warm you up on these cold nights! We’ve posted a variation before, but have since changed the base spirit, as well as some of the other ingredients in the recipe. To prepare the glass: fill a rocks glass with ice, add ¼ oz Sirène Absinthe Verte. Let it chill. Stir ingredients well with ice. Then swirl the rocks glass with the ice/absinthe combo and dump (or keep the absinthe for later!). Strain the cocktail into the rinsed rocks glass, then garnish with a swath of orange peel.